Apples. Photo Courtesy Tait Farm. 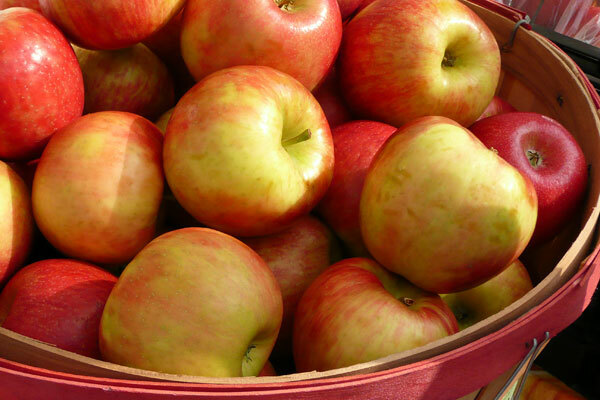 Honeycrisp apples are crisp and sweet and ideal for fresh eating, as well as for cooking and baking. Our friends at Way Fruit Farm harvest Honeycrisp apples each year and may still have some left this season. For hours and directions to Way Fruit Farm, visit their website. Then enjoy this recipe for Apple Muffins. They can’t be beat served warm with a glass of milk. Preheat oven to 350°F. Lightly grease 12 muffin cups. Place apples and water in a pan; bring to a boil over high heat. Reduce to a simmer and cook until softened. Drain and transfer apples to a food processor; puree until smooth. Set aside. Cream butter and sugar together until fluffy. Beat in eggs. Add apple puree and vanilla; beat until smooth. In a medium bowl, sift together flour, salt, and baking soda. Stir flour mixture into butter mixture until just combined. Spoon into muffin cups. Bake until tops are springy to the touch, 15 to 18 minutes.